It is possible to make the item editable by setting the Qt::TextEditorInteraction flag using setTextInteractionFlags(). Specifies whether QGraphicsTextItem should automatically open links using QDesktopServices::openUrl() instead of emitting the linkActivated signal. By default, if the item's text has not been set, this property contains a null text cursor; otherwise it contains a text cursor placed at the start of the item's document. Note that QGraphicsTextItem keeps a QTextDocument internally, which is used to calculate the text width. See also textWidth() and QTextDocument::setTextWidth(). 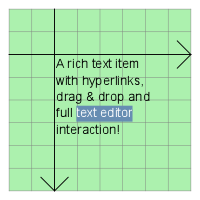 The width is calculated with the QTextDocument that QGraphicsTextItem keeps internally. See also setTextWidth() and QTextDocument::textWidth().